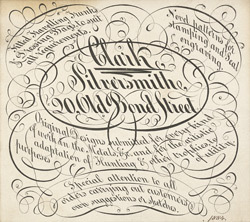 This is a leaflet for 'Clark', a silversmith working in Old Bond Street, in London. Throughout the 18th century there were very few special typefaces. The first typeface to be designed specifically for posters and leaflets was fat face, which had contrasting thick and thin strokes. The scroll style of lettering used on this advert is beautiful and eye-catching however it is not particularly easy to read.